A single entry blog about Bill, Troy, and Steve on a 2-day golf trip in Boise and McCall, ID. Working in real estate, I meet a lot of people coming to Idaho for the first time and it is always interesting to hear their impressions. Some come to the area thinking they'll see nothing but miles and miles of potato farms, others expect majestic mountains with towering trees and sparkling lakes, while others yet expect a simple high desert landscape. The reality is that Idaho represents all of those terrains but for flat out gorgeous scenary Coeur d'Alene and McCall steal the show with crystal clear water, beautiful trees, and pretty mountains. 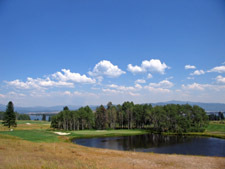 Like other Idaho vacation destinations, McCall has grown in popularity and golf courses over the last few years as Boise residents have come north enjoy cabins and second homes. 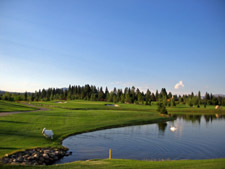 But with the installment of the Tamarack Resort developed by international businessmen, McCall has become more than a retreat for Boise residents and has brought in the likes of Andre Agassi and others. This two day jaunt over to the western side of the state was a typical "balls to the walls" type of trip we us leaving at 6:00 AM on Friday and pulling back into Pocatello around 2:00 AM Sunday morning. Loading up this time with the Gurus was Steve and Troy. This was going to represent Troy Bell's first official guys-only golf trip and he couldn't have been happier. Since Troy owns a healthcare facility in McCall he was certainly familiar with the area, but hadn't played any of the courses on tap for the trip and was ready for the opportunity. So with the sun having just creeped over the horizon we loaded up and headed west on I-84/86 towards the state capital. After getting formal announcement over the load speaker from the starter, it was time for the Satterfield foursome to tee off as the 9:45 AM tee time at BanBury golf course in Eagle (just outside Boise) which acted as host to the 2005 U.S. Junior Girl's Amateur Championship, the first ever USGA championship held in the state. Banbury is a realtively flat public access course that works through a development and features enough water hazards to keep the pro shop supplied with recycled balls for years to come. Depending on who you talk to, BanBury and Falcon Crest are generally regarded as the two public access jewels in the area. After wrapping up at BanBury we ran over to a local Wendy's where the cashier screwed up my order and comped my lunch. Comped lunches are great, however when you get a burger you don't like in place of the chicken sandwich you ordered it can be a bit anti-climatic. After we each pounded about 1200 calories it was time to roll up to McCall and tee off at the pristine conditioned Whitetail golf course. A day at Whitetail is flat out posh; criss-cross mowed fairway, immaculate green, luxury golf carts, and a laser range finder. 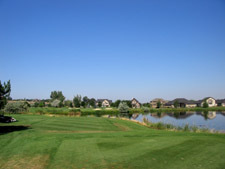 The Andy North design offers a beautiful setting with large pine trees throughout the front nine and a more wide open back nine that boasts some impressive water features. Troy generously offered to buy dinner that night as we sat around reliving some of our favorite shots from the day. Friday night was spent at the brand new AmericInn in McCall where we soaked our buns in the hot tub most of the evening after pounding some Mexican food for dinner. The next morning we were off to the brand new Jug Mountain golf course. The first nine holes were opened for play late in 2004 while the rest of the course opened up last year. I usually do plenty of research before heading off to a course but had limited resourses heading into Jug Mountain. The course's website didn't feature a course layout, description of holes, or give much indication at all what to expect for the day; as a result my expectations weren't super high. Boy was I surprised! Jug Mountain was a great course that had some exciting elevation changes, a handful of forced carries, tons of trees, and a decent amount of water hazards to contend with. While Tamarack still has to be considered the gem of the area, Jug Mountain (the 51st course I've played in Idaho) shot further up my "Idaho favorites" than I ever would have expected going into the day. The current hole numbers will be reassigned once the permanent clubhouse is finished, and if I have the rerouting correct in my head the holes that you are sure to enjoy the most (from the tips) are 1, 6, 12, 13, and 16. The tip tee box on #6 is just awesome! The final round of the trip was at my second favorite course in Idaho (behind Black Rock), Osprey Meadows at Tamarack Resort. The Robert Trent Jones II design features a increasingly popular layout trend that boasts three par 3s, three par 4s, and three par 5s on the front nine followed by the standard 2/5/2 layout on the back nine. There are so many reasons to love Tamarack. 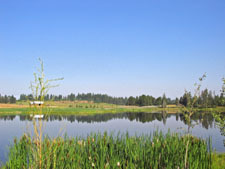 The impressive trees, the views of Lake Cascade, and naturally the stiff challenge the course offers. The other thing I love about Tamarack is the fact that there isn't a weak hole on the course; every single hole is well thought out and nothing feels like it was just thrown in or stuffed into a restrictive area. It is simply solid golf all day long with no stretches where a golfer could get bored. My favorite holes and numbers 3, 4, 8, 9, as well as the final four holes of the day. In addition, the 14th (nicknamed the Beast) is worthy of being considered one of the most difficult holes in the state; which our foursome somehow managed to all score par on. After wrapping up at Tamarack we hit the road for Boise to grab a burger, shake, and endless steak fries at Red Robin. A couple of thousand calories later we were full and back on the road to get home to our wives. We chatted about life, sports, and of course golf on the way back trying to keep ourselves awake and when all was said and done, it was another great trip to an impressive Western United States destination boasting some of the prettiest and funnest holes in Idaho!